Is President of Mexico scenting a Trump victory? If the mainstream media are to be believed Donald Trump is already dead and buried. They have gone to unprecedented lengths to vilify and castigate him – and I suspect have gone so far in their vendetta as to now damage their own credibility. 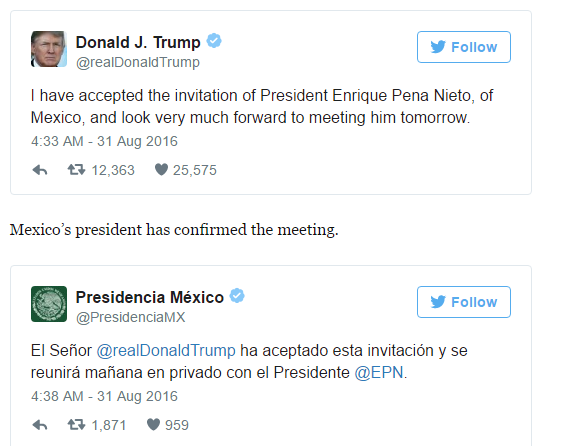 Why then has the President of Mexico invited Trump for private talks? They are going to be meeting today. Washington Post: Donald Trump is considering jetting to Mexico City on Wednesday for a meeting with Mexican President Enrique Peña Nieto, just hours before he delivers a high-stakes speech in Arizona to clarify his views on immigration policy, according to people in the United States and Mexico familiar with the discussions. It could be that President Peña Nieto is just playing safe and making sure that channels to a President Trump – however unlikely – are not completely closed. But, I don’t buy that. If Trump’s case is as hopeless as the media claim it to be, Nieto does not need all the negative publicity and certainly not from Hispanics within the US. Or could it be that the media does not represent the reality among the US electorate and President Nieto is anticipating something that the US media are in denial about? This entry was posted on August 31, 2016 at 8:22 am and is filed under Behaviour, Media, Politics, US. You can follow any responses to this entry through the RSS 2.0 feed. Both comments and pings are currently closed.